"It was cheesecake. It was fine. It had a buttery, crumbly, graham cracker crust, with a very rich yet light, cream cheese filling… "
One of my favourite FRIENDS episodes features Rachel, Chandler and a cheesecake. So this cheesecake happens to find it's way into Chandler's living room and eventually into his tummy when, infact, it was supposed to be delivered to his neighbour. Rachel first calls Chandler a thief, but cannot resist the temptation herself and along with Chandler, polishes off not one or two, but three cheesecakes! And all this while, I was wondering what a cheesecake tastes like. So I set out to find a cheesecake in Bangalore, found one on the other side of the city and really liked it. I later discoverd that a bakery just down the road sold cheesecakes. So I went with great expectations, bought the cheesecake, resisted the temptation of hauling an auto and walked home. All along the way, I was hoping the cheesecake wouldn't melt, reminding myself that it was not ice-ream. After reaching home the first thing I did, ofcourse, was bite into the cheesecake. Wham! a block of cheese hit my mouth. Ugh?? It was not luscious, creamy cheese, but a block of cheese - the kind you grate or chop to throw into your pasta. Really?? Rachel: Wow. My God, so creamy. Oh my God, this is the best cheesecake I have ever had. Since then I have had cheesecake several times. And each time I ate it, I wish I had baked it. Exactly the feeling you get when you see a gorgeous dress and want to wear it. Infact when I slowly started learning the ropes of baking, three cakes featured in my 'must-try' list - tres leches, tiramisu and cheesecake. These cakes now have a special place in my blog. Tres Leches was what I started with, tiramisu featured in my blog's b'day post and cheesecake seemed apt for the 100th post. After hunting for a good recipe, I came across the following recipe on Joy of Baking by Stephanie Jaworski. Crossed my fingers and tried it. Turned out exactly what I was hoping - a buttery, crumbly, graham cracker crust, with a very rich yet light, cream cheese filling. Except, I used digestive biscuits instead of graham crackers. To powder these biscuits, just pulse about 18 to 20 biscuits in the blender till you get the desired powdered consistency. Grease the bottom and sides of a 9" springform pan with cooking spray. 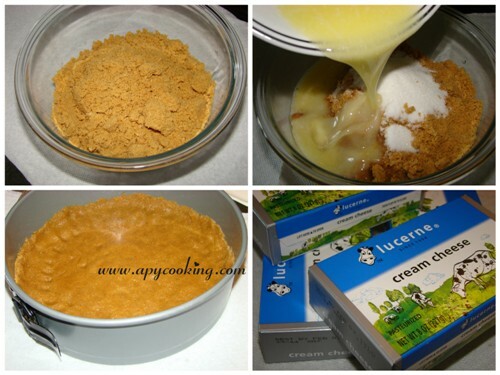 In a bowl, mix biscuit crumbs, sugar and melted butter . 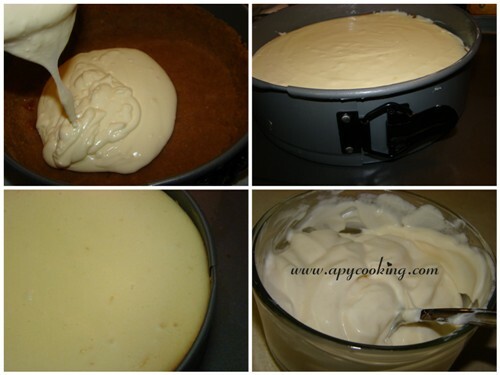 Pour into the springform pan and press evenly onto the bottom and 1 inch up the sides of the pan. Refrigerate. In a large bowl, with an electric mixer beat cream cheese. Add sugar and flour and beat till smooth and fluffy. Add eggs one at a time and beat with each addition. Keep scraping the pan. 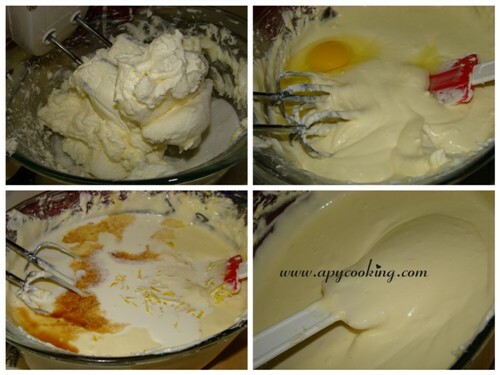 Add vanilla, lemon zest and whipping cream and beat further. Somewhere in between combine sour cream with sugar and vanilla. 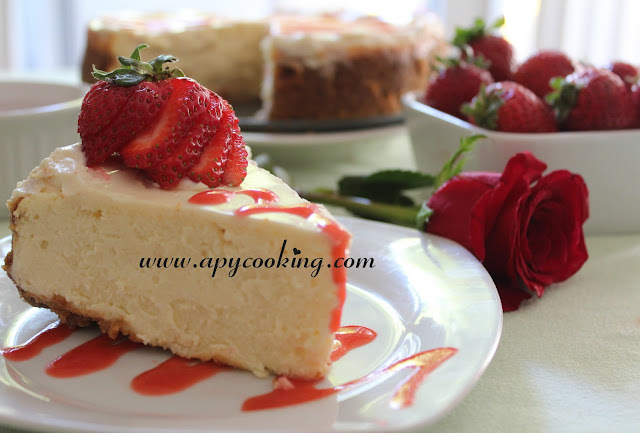 Once you remove the cheesecake from the oven, spread this topping on the cheesecake with a spoon or offset spatula. Return it to oven and bake at 250ºF for another 10 to 15 mts. Remove, run your spatula around the sides. Stephanie suggests doing this to reduce any cracks on top. To serve, unclasp the pan. 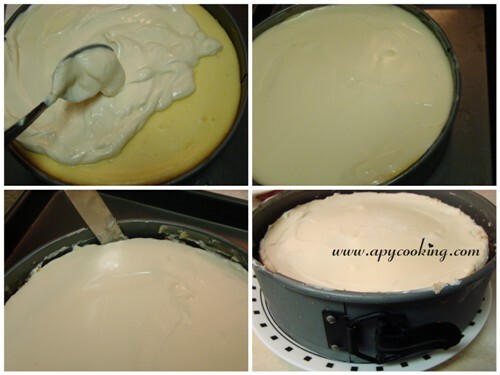 Run a spatula around the sides of the cheesecake, remove sides of the pan. I noticed that the crust was tightly stuck to the bottom so I did not bother to transfer the cake onto a cakeboard. Next time I will probably use a parchment paper. 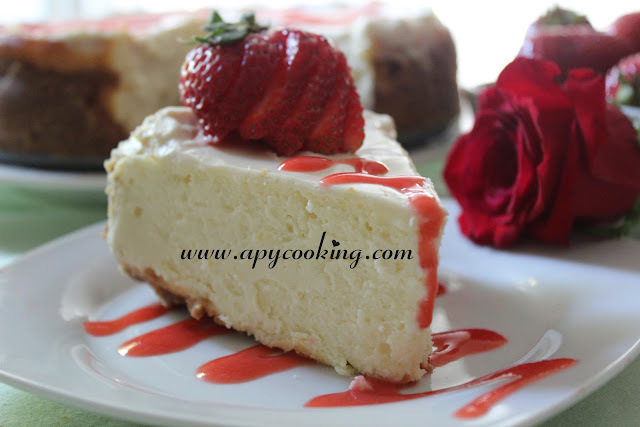 To give the cheesecake a pretty pink look, I made some strawberry coulis and drizzled it on top. To make the coulis, just blend 10 to 12 chopped strawberries (stem removed) with 2 tbsp sugar into a smooth paste (without water). Run this through a large sieve, pushing down the pulp with your fingers. Collect the juice and drizzle over the cheesecake. I filled a piping bag (you could use a ziploc) to help drizzle better. A big thanks to all my dear readers. Your support and encouragement has kept my blog going. I really appreciate it :)!! wow wow wow!! simply divine!! yyyuuummmmmmmmm.. sure to try out!! book marked!!! Congratulations on your 100th post Apy! Your blog is not just a collection of recipes, but has been a visual treat for me in times of hunger, pregnancy cravings and when I was low on spirit! It has inspired me to make stuff like bread and stuffed buns which I had always thought was possible only by (Iyengar) bakers! I admire the way you have been consistent with blogging,inspite of being so busy with your darling son. You are truly an inspiration! Thanks Akshata, you are so kind. wow ! Congrtats Gondi ! and wish u a long journey with same enthu tht u started with .. going on great ! The century hit ws indeed a sixer ! cant take my eyes off tht cheesecake ! Congratulations and here's to the next milestone! Do check out my blogs for my first blog anniversary giveaways! Lots of wonderful prizes to be won! 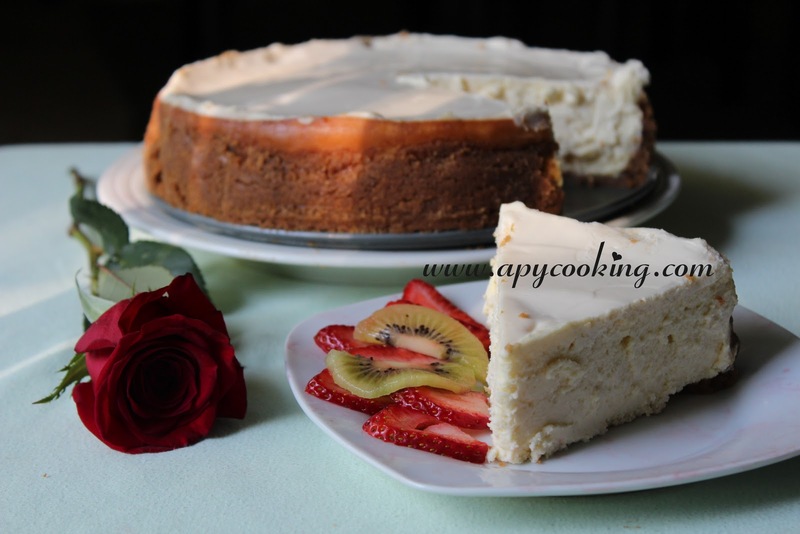 Apy, that is a stunning looking cheesecake, and what beautiful styling too. The 100th post is always a milestone, and you shure have celebrated it beautifully. I wish I could have a piece of that cake right now!!! 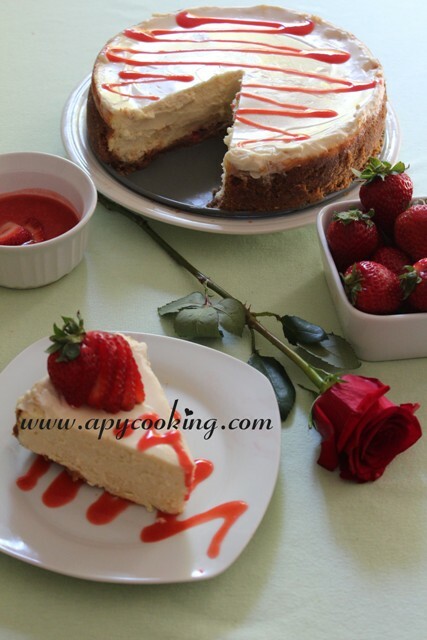 Congrats on ur 100th post Aparna, cheesecake looks seriously excellent and elegant..
Hi Dear. Thoroughly enjoyed the virtual treat. The cheese cake looks so fabulous, I'm sure the family must have relished it. Hearty congrats on hitting the century.